Security. It’s something that concerns all of us. Just recently I went away on holiday and we left our cat in the house with someone popping in to feed her. Call me daft, but I wanted to keep an eye on the cat, the house and just ensure that she was getting fed and let out. I’ve got an old HTC Desire in the house and it’s got a busted screen, so I wanted to put it to good use. There’s lots of camera apps that’ll let you upload pictures or monitor your environment via a smartphone, but I chose IP Webcam by Pavel Khlebovich. It’ll basically turn your phone into one of those fairly expensive webcams that you can attach to a network. Fire it up, point your phone at the area you want and plug in a charger. You can disable the screen if you want to hide the fact that it’s acting as a camera. I’ve shown it below using a different phone so you can see it in action. Then I hit a problem. I’ve recently switched my broadband provider, and I no longer get a fixed IP address. It changes if the router is rebooted and, if there’s a power cut while I’m away, I won’t know the IP address any more. Now, I’m going to get a bit geeky here so hang tight, but I ended up using a Bash script within a local Linux machine at home to go onto the internet, find my external home IP address, then connect to a virtual server on the internet and write that IP to a web page in order to create a place for me to view the camera. I then used some network and port address translation on my router to make the smartphone externally viewable. You can scale this up if you wish. If you have lots of old mobile phones knocking about then, with a bit of trickery, you can give every single phone a different port (8080, 8081, 8082) and dot the phones around your house. This could, if you’re blessed with stacks of handsets, give you a full CCTV system which you can view from anywhere with an internet connection. 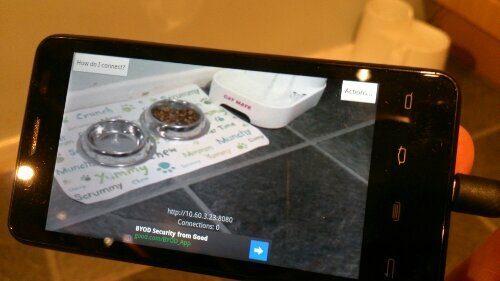 The IP Camera software lets you view an image or watch a live stream from your smartphone, which is pretty useful. You can also rotate the image, change the port, resolution and set a username and password for extra protection. What it doesn’t seem to do is motion detection, and that is pretty useful. However, while we were away this setup worked well enough. When I got home though I started thinking. I wanted to push things a bit further and put the old HTC Desire to even better use. 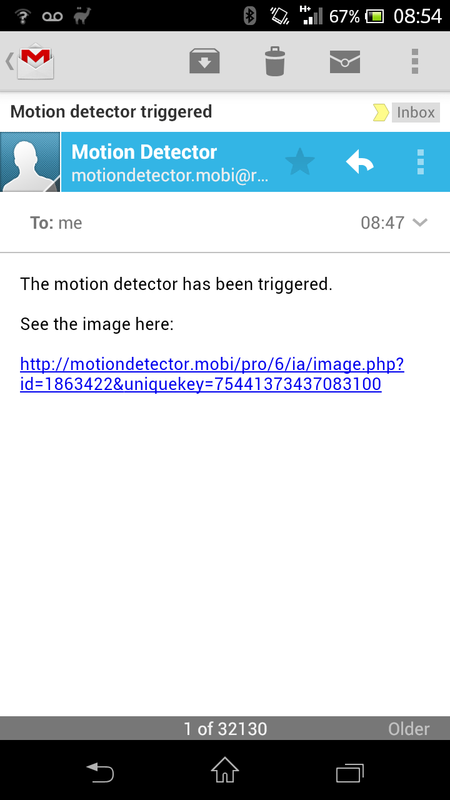 I’ve still got the Ovivo SIM so I plonked that in and grabbed an app called Motion Detector. This app basically does what it says on the tin – it’ll detect movement and, when it spots some it’ll email or text you with a link to the picture and show where the movement was detected. You can set the sensitivity and all pictures are hosted on their server, so no FTP stuff to worry about (although you should be aware that your pics are uploaded to a server you don’t control). To give it a proper test I used it while out shopping this time. I didn’t want to “just” have my phone in the house, and instead wanted to stick a security camera in my car. 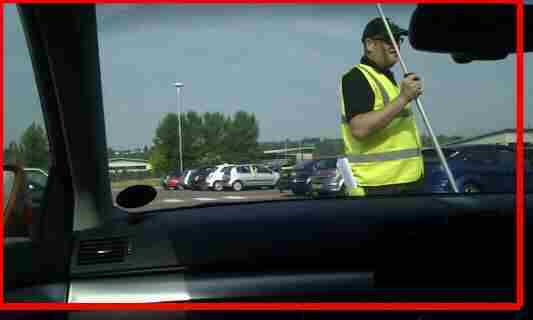 This was a tad risky because I had to leave my Desire on full view in my motor whilst parked up in a public car-park. Not a fantastic idea, but I’m a geeky bod who writes for a website so I’ll give it a spin. 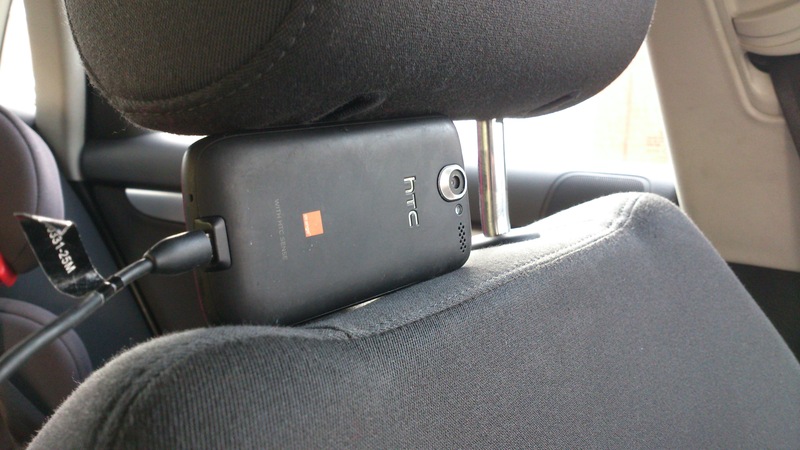 I wedged the phone under the head-rest and left it plugged into the cigarette lighter to keep the old battery alive. The result? Well, it worked a treat. It went off a few times when people moved their cars, but I got this corking shot of a workman measuring-up around the car-park. It doesn’t use a great deal of data either as the pictures that get uploaded aren’t the full resolution, but as ever be careful with your data allowance. So, if you want to keep an eye on your home, your car or your … err.. shed, get your old smartphone out of the drawer and put it to good use.